Driven by the global competition, the development of industrial robots is increasing rapidly. By 2018, their sales will grow by 15% every year. But average classical robots are prone to making mistakes as their accuracy is based on mechanical systems. And such errors grow exponentially with the robots’ size. Therefore the manufacturing and repairing of large components of more than 10 meters long are still carried out manually today. Innovation: AITIIP, EARTO member through FEDIT, developed MEGAROB, the biggest robot in the world using a laser tracker for very high level of accuracy. It is able to cover a large workspace by moving through a crane for manufacturing operations in medium and large complex components. A laser track continuously monitors the robot’s position with 1000 scans/second. The operations are controlled by a computer program and tailored to the project environment. 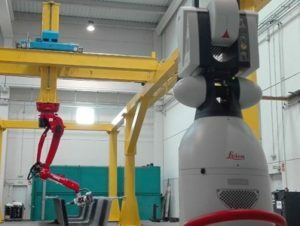 Impact delivered: This multifunctional robot ensures accuracy, increasing industry’s competitiveness by reducing time and production cost. It is flexible and scalable in size to fit other industrial facilities or applications. MEGAROB solutions are in the commercialization phase. MEGAROB pilot line is currently running in AITIIP facilities and performing milling, drilling and polishing operations on large composite parts, achieving 0.3mm 3D accuracy in dynamic movements.